My Audi A3 Instrument Cluster is faulty – Can Sinspeed Help? Replacing your Audi A3 instrument cluster can work out to be extremely costly as they are key coded in such a way that if you are replacing the whole unit, they will require programming in. Here at Sinspeed, we hold our own in-house repair solution so you can avoid the costly repairs by having your own unit repaired! Your repaired Audi A3 Instrument Cluster will be returned to you with Lifetime warranty for 100% Satisfaction. 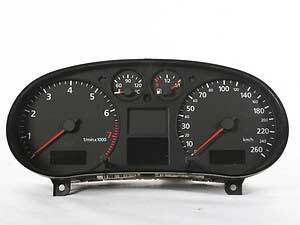 If your Audi A3 S3 dashboard / Instrument cluster (speedo) is faulty then contact us today on 0844 847 9999 and we’ll be more than happy to assist you. Tags : Audi A3 Centre Display Not Working, Audi A3 Cluster Repairs, Audi A3 Dashboard Display Not Working, Audi A3 Fuel Gauge Not Working, Audi A3 Instrument Cluster Repaired.